My name is Biscotti and I'm a Yellow Labrador Retriever. 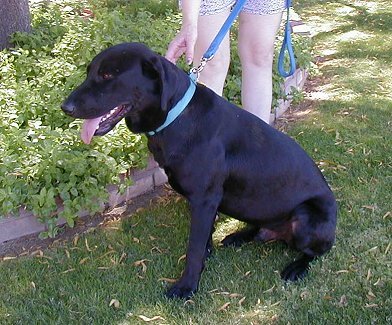 My people and I are working with Desert Labrador Retriever Rescue here in Tucson. We are providing a foster home, which is temporary care for a dog until a new owner can be found. The foster home also evaluates the dog's temperament and behavior, so that we can find just the right family for that particular dog. Since they asked me to help evaluate the dogs that need homes, I thought I would spotlight a few for you and see if maybe you might like one. Look for a new "Lab Report" posted here about once per month. Tux is a one year old black male that has had a rough go at life his first year. His previous owners moved away and left him to fend for himself on the property. He was never an inside dog. Some kindly nearby neighbors realized he was on his own and helped care for him before he came to DLRR. He is in a foster home now, learning what it is like to live in a house. It is a whole new world for him, but he is learning quickly about crate training and housebreaking. He learned how to use the doggie door very quickly. Tux needs a special, patient home that will be willing to train him with gentle positive reinforcement. He is very sensitive after all he has been through, so he needs to be reassured that he is now safe, secure and won't be abandoned or hurt. He is very loving, good with other dogs, and eager to please. He has not been around cats so it is unknown how he would do with them. Tux is an energetic young lab that could knock a little one over so it is probably best that he would go to a home with older children. If he were to go to a home with another dog, it would be ideal that the other dog be playful. He loves to play and would likely annoy an older dog. With lots of love, patience, and training, Tux will make a great addition to a special family. Click here to see other dogs available. Biscotti's Lab Report is written by Biscotti and HereInTucson.com is not responsible for what he writes. He is a dog after all. Copyright © '00-'10, HereInTucson.com. All rights reserved.